The Icelandic Cancer Society offers systematic screening for breast and cervical cancer. The service has two main purposes: Firstly, an effort to diagnose breast and cervical cancer at early stages, and secondly an emphasis is placed on preventing active cancer in these organs by detection in a precancerous stage. Our screening does not offer protection from other types of cancer. Women are offered screening for cervical cancer from the age of 23 to 65 and for breast cancer from 40 to 69. The screening takes place at our service centre in Reykjavík, in most primary care clinics outside the capital area and at the Akureyri hospital radiology ward. Private care gynaecologists also take part in our efforts by taking smears (pap tests) and encourage women to get screened for breast cancer. The service provided by the Krabbameinsfélag is organised and managed in cooperation with the Icelandic Directorate of Health and Icelandic National Health Insurance. When you arrive at one of our screening stations we need you to give us some information regarding your health. One of our nurses can assist you if you wish. We will need information about matters such as: Surgeries, the last time you had your period, number of births, birth control, menopausal hormones and any symptoms you may have had in the past months. All this information is significant in interpreting cellular samples and breast X-ray images. The information may also provide indicators whether you will need further tests or not. After providing us with your medical history we direct you to the waiting room where you can wait until you have your screening procedures done. Its preferable that you empty your bladder before the exam if you can. Specially trained midwives do the cervical smear in our service center and also in primary care clinics around the country. You are invited to lay on a gynecological bench and as your labia, vaginal canal and cervix are examined and a smear is taken through the vaginal opening. You may experience a little bleeding or a little blood in your excretions afterwards. If you are 40 years or older we will also do an x-ray of your breasts. The midwife will inform you immediately if she detects a problem with your bladder or uterus, abnormal bleeding or signs of infection. You will receive a letter from us with the results of your exam within 3 weeks. If the findings show an abnormality or something that needs to be further investigated, you will receive a call from us right away. Something abnormal is detected in your breast x-rays. If that happens you are called in for closer examination or to have additional x-rays. In most cases we do further x-rays, but we also do ultrasound exams and we may take a cell sample from your breast (by needle). If precancerous changes are detected in your cervical sample it may be necessary to do another smear within a few months or to do a colposcopy. By doing the colposcopy a small tissue sample is taken from the cervix. In spite of normal results, a disease may develop between your regular visits. We strongly advise you to be on the lookout for symptoms of either cervical or breast cancer. If precancerous changes are detected, we need to keep a further eye on you for a number of years. Precancerous changes are often linked to HPV an infection. After treatment, the virus will still be present so changes may reoccur. 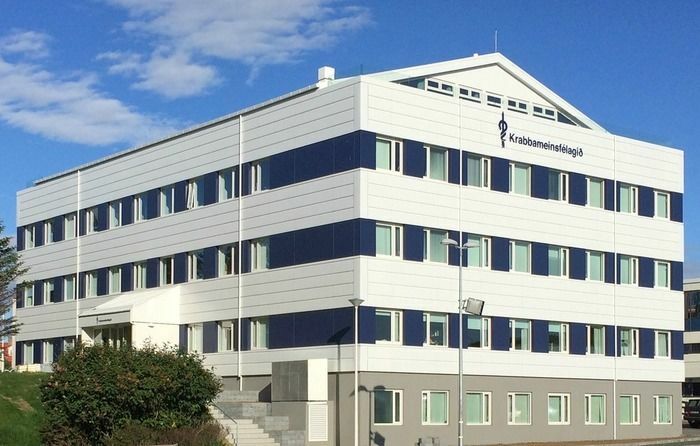 According a contract between the Krabbameinsfélag and the Icelandic National Health Insurance (supervised by the Directorate of Health), we are responsible for medical supervision and follow-us of all women diagnosed with cellular changes in their cervix, regardless of where the exam took place, be it in our facilities or in a private gynecological clinic. The Icelandic Cancer Society (ICS) was established on the 27th of June 1951. The ICS has a remarkable history and has through the decades concentrated its engagement on prevention (e.g.cancer detection), education, research and patient services. A new policy has recently been adopted for the Icelandic Cancer Society, which should provide guidance to the year 2018.The Icelandic Cancer Society is an umbrella organization of 34 member associations (24 local associations around the countryside and 10 support groups). At the Annual General Assembly, seven members are elected to the governing board of the Icelandic Cancer Society. The current chairman is Valgerður Sigurðardóttir and the CEO is Halla Þorvaldsdóttir. The Board meets regularly every month. The Chairmen of the various member cancer associations convene as a rule in the autumn, often outside the capital area. The main role of the Icelandic Cancer Society is to be at the forefront of the fight against cancer. Values of the Icelandic Cancer Society were chosen by representatives of the member associations and the employees. These are: Trust, Professionalism, Care and Respect. The Goal of the Icelandic Cancer Society is supporting and promoting in every respect the fight against cancer by for example increasing public knowledge about these diseases, supporting and conducting research, running and supporting the National Cancer Registry, screening for cancer, supporting progress in the treatment of cancer and care of cancer patients, and securing their interest in every way. The screening for cervical cancer and breast cancer is the most extensive task of the Cancer Society. From 1964 the Cancer Detection Clinic of the ICS has organized and run the screening for cervical cancer, and for mammary cancer from 1973. According to a service agreement with the Ministry of Health, the Cancer Society organizes and implements cancer screening for women from 23 to 65 years of age in case of cervical cancer and from 40 to 69 years of age in case of breast cancer. Currently, a revision of the agreement between the Icelandic Cancer Society and health authorities is underway, and hopefully the next contract will come into effect by the end of this year. The Icelandic Cancer Society has for some time advocated for population based screening for colon cancer, and emphasizes that it should start as soon as possible. The Cancer Registry was established in 1954 and is among the oldest of such nationwide registries in the world. The coverage is outstanding, as information is gathered about almost every cancer diagnosed in the country. The data processing aims to accumulate knowledge about the causes and nature of cancer, and the extensive data bank allows for various types of studies, e.g. epidemiological research. Recently, registration of the stages of cancer has been included in the data collected and some clinical measures will be included, , which will allow for a wider scope of research. The scientists at the Cancer Registry have published more than 500 scientific articles based on the registries data. The Icelandic Cancer Society has for some years engaged itself in securing the rights and interests of patients, for example by putting forward information and remarks to the health authorities, commenting on relevant issues and engaging in general debates about cancer related issues. Now, the Ministry of Health is in the process of developing a new cancer plan for Iceland, and members of the cancer associations and others are hopeful that it will be useful for the cause of the cancer patients. Education is instrumental in the prevention of cancer and of health promotion. The Lottery of the Icelandic Cancer Society secures finances for most of the educational activities and one of the local associations, the Cancer Society of Reykjavík, is co-responsible for that. An educational and professional advisory council has during the last few years put increasing emphasis on the website of the Cancer Society ( www.krabb.is ) There, general knowledge and information on various cancer issues can be found, and is updated regularly. In addition, various preventive projects are supported be the Lottery, for example actions to reduce smoking. For the last decades the Icelandic Cancer Society has supported research in various fields of cancer, e.g. by as operating a research laboratory for two decades (now moved to the University of Iceland) and collecting and preserving a valuable biobank. The ICS recently started an extensive research endeavor in collaboration with the University of Iceland, Heilsusaga ( http://heilsusaga.hi.is/ ) a cohort study of 100.000 Icelanders. This year a new Research Fund of the Icelandic Cancer Society has been established and will support domestic research on cancer. The research fund will be built on financial support from the Cancer Society and it's member cancer associations, as well as on contributions from older research funds that are currently run by the ICS. Supporting patients and their significant others is a matter of priority by the ICS. In 2007 a new Counseling Service was started at the ICS, based on the work of consultants that had been in operation for decades. The Counseling Service offers information, education, psycho-social support, and various other services to those that have been diagnosed with cancer, their families and others that are affected by the diagnoses. Two nurses and a social worker are currently employed but are assisted by many other professionals. Several courses are offered for patients and others, -now also for those health care professionals that work with cancer patients. Counseling via the phone (call center) is growing as individuals can call free of cost and obtain information regarding many disease related issues. The ICS co-owns eight apartments in Reykjavik where patients from the countryside can stay with significant others while being treated. Some local cancer associations have hired staff and opened local service centers. These are located in smaller communities in the countryside and enjoy the support of the ICS as well as the Counseling Service. The office of the Icelandic Cancer Society is responsible for daily management and serves the different units. The yearly turnover is about 5 million euro. Employees are now 56 in 43 full time positions. The main sources of income are support from the state (cancer detection clinic and registry), fees for providing services (cancer detection clinic) and support from the general public for all other aspects of the work of the ICS. Financial support from from the general public and firms comes in different forms. Among these are presents, inclusive testament and commemorative presents, monthly contributions, purchases of different things sold for the benefit of the ICS, donations, and memorial cards. All are very valuable to the ICS that bases it´s very existence on these contributions. Marketing issues and campaigning have during the last year become more central in the work of the Icelandic Cancer Society. The ICS runs annually an awareness campaign and fund raising initiative in October for women under the mark of the „Pink Ribbon“. During the last seven years, March has been devoted to an action called Mustache March „Men and Cancer". The Icelandic Cancer Society is one of the founders of Almannaheill, union of NPOs in the third sector, and also a member of The Icelandic Association of Health Care Providers. The Icelandic Cancer Society is one of the members of the Nordic Cancer Union (NCU) as well as a member of the European Cancer Leagues (ECL) and the Union for International Cancer Control (UICC). Book an appointment for breast and/or cervical cancer screening. The appointment will be confirmed by email. You can also make an appointment by calling +354 540 1919 from 8:00-15:30 weekdays, except Fridays when appointments can be made until 14:00. View information for cancer screening locations. Requests or cancellations can be sent to leit@krabb.is. * Hvað er 4 plús 2?